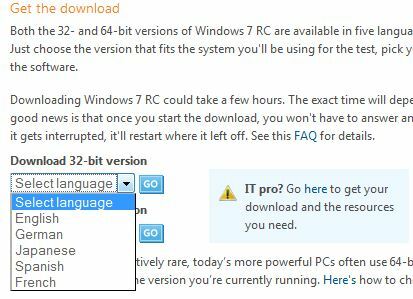 The much awaited Windows 7 Release Candidate (RC), which has the build version 7100 official public download availability has begun, as scheduled. The full DVD ISO images for Windows 7 RC have earlier been leaked to Internet, and published to MSDN and TechNet subscribers. Together with the download of Windows 7 RC, downloaders can also receive a free product key to activate Windows 7 RC. After server crashing experience when releasing Windows 7 Beta, everyone appears to get the same set of Windows 7 RC product keys, similar to distribution of Windows 7 Beta product key. Windows 7 RC is available in English, French, German, Japanese and Spanish. Unfortunately, Arabic and Hindi language which available during Windows 7 Beta has been dropped. Both 32-bit (x86) and 64-bit (x64) of Windows 7 RC is available for free download. The installed Windows 7 RC system will expire on June 1, 2010 after activation, with bi-hourly shutdowns will begin on March 1, 2010. Or, download using official direct HTTP download links of Windows 7 RC. Users running the Windows 7 Beta will need to do a clean installation of the Windows 7 Release Candidate as direct build-to-build in-place upgrade from earlier pre-RC Windows 7 is not allowed. For users who insists on upgrading instead of fresh installing, use this hack to bypass version check to allow Beta upgrade to Windows 7 RC.